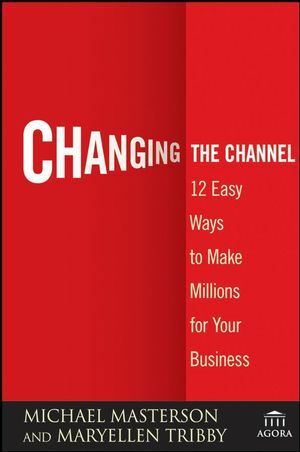 Written in a straightforward and accessible style, Changing the Channel offers you a detailed look at twelve of today's most important marketing channels-explaining how each one works individually as well as in conjunction with each other, leveraging the power of your message for explosive profits. Page by page, you'll become familiar with a variety of approaches, including direct online marketing, social media, public relations, radio and television advertising, direct space ads, event marketing, telesales, telemarketing, joint ventures, affiliate marketing, and direct mail. With this book as your guide, you'll quickly discover how marketing across multiple channels can help develop quality customer relationships and improve the bottom line of your business. Michael Masterson has developed a loyal following of more than 350,000 subscribers with Early to Rise (www.EarlyToRise.com), an e-newsletter published by Agora Inc. Throughout his remarkably successful business career, Masterson has been involved in two businesses that grew beyond $100 million, two more that exceeded $50 million, and at least a dozen that surpassed the $10 million mark. He is also the author of the New York Times, Wall Street Journal, and Amazon.com bestsellers Ready, Fire, Aim; Seven Years to Seven Figures; Automatic Wealth; and Automatic Wealth for Grads . . . and Anyone Else Just Starting Out (all published by Wiley), and Confessions of a Multi-Millionaire. Subscribe to Michael Masterson's daily e-zine at www.EarlyToRise.com. MaryEllen Tribby is currently CEO and Publisher of Early to Rise. She was responsible for quadrupling sales and profits within her first fifteen months there. Tribby is also the founder and Executive Publisher of Investor's Daily Edge and Total Health Breakthroughs, ETR's sister publications. INTRODUCTION Shopping for Homes: Easier, Faster, Cheaper By MaryEllen Tribby. CHAPTER 1 Marketing in the Twenty-First Century: How Quickly Things Have Changed. CHAPTER 2 “DRM” and “MCM”: The Two Most Important Acronyms in Advertising Today. CHAPTER 3 Direct-Response Online Marketing: Squeezing the Juice Out of the Low-Hanging Fruit. CHAPTER 4 Social Media: Informal Communication, Powerful Profits. CHAPTER 5 Search Engine Marketing: Busting Myths and Driving Sales. CHAPTER 6 Teleconferences: All You Need Is a Phone and Good Ideas. CHAPTER 7 Direct Mail: An Old Dog That Still Knows a Few Tricks. CHAPTER 8 Direct Print: Getting More Than Ever for Your Ad Dollar. CHAPTER 9 Direct-Response Television: Why Super Bowl Ads Don’t Work. CHAPTER 10 Direct-Response Radio: Music, News, Sports, and Talk = Money. CHAPTER 11 Telemarketing: Inbound, Outbound, Money-Bound. CHAPTER 12 Joint Ventures: Only Streets Should Be One-Way. CHAPTER 13 Event Marketing: Having Fun with Your Customers. CHAPTER 14 Public Relations: Man Bites Dog; Man Gets Famous. CHAPTER 15 The Incredible Power of a Multi-Channel Campaign. CONCLUSION Smoking at Joe’s By Michael Masterson.